Adventure Silk Road Inc is an eco-friendly professional outfit committed to a high quality of service. We have, for years, been providing our clients with a truly authentic and uplifting experience of the diverse cultures, religions and landscapes of the Himalayan region. We offer a truly unique traveling experience to the Himalayas with our various popular packages of treks and tours. We have also been recommended by Rough Guide, Lonely Planet and AVUI diumenge, a Spanish travel magazine. This tiny Himalayan state is a wonderland by all accounts. Overlooked by Mt. Kanchenjunga, the world's third highest peak, Sikkim is attractive equally for the sightseer, the adventure sports enthusiast and those interested in Buddhism and Tibetology. Sikkim, a mountainous region in the eastern Himalayas, has 600 species of birds, or about half of the over 1200 species to be found in India. Perched between Nepal in the west, Bhutan in the east, and Tibet( China) in the north, Sikkim is 7300 square miles in area and contains Mount Khangchendzonga, the third-highest peak in the world. Formerly a kingdom, since 1975 it has been a tiny land -locked province to India. Sikkim, with its rich biodiversity, has 150 lakes ranging in altitude from 200 meters to almost 8000 meters. Besides birds, Sikkim has 4000 species of flowering plants, making it a botanist's paradise. It has 600 species of orchids, and 40 species of rhododendrons. With the introduction of eco-tourism, including serious birding, Sikkim has begun to focus on enterprise-based conservation. A hospitable population that's predominantly Buddhist, many fine old monasteries rich with frescoes, religious paintings on silk and statues of the Buddha's various incarnations make it a soothing place to be in. Gangtok, the capital, abounds with pagoda like roofs of many buildings and the presence of crimson robed monks in the bazaars. The Institute of Tibetology, the only one of its kind in the world, was set up by the erstwhile ruler to promote research on Mahayana Buddhism, and on the language and traditions of Tibet. Lower down the hill is the famed orchid sanctuary where 500 species of orchids indigenous to Sikkim are cultivated. Sikkim offers several treks that lead through pine forests, through picturesque valleys, monasteries and to mountain lakes. It is also the base for mountaineering expeditions and the rivers Teesta and Rangeet offer excellent river rafting. A number of good hotels and lodging houses exist in Gangtok. The gateway to the North Eastern Part of India, Sikkim is another breadth-takingly beautiful Hill Station in India, which is also coveted for its Strategic viability. The intersection with the Chinese border makes it particularly vulnerable to trans border intrusions. 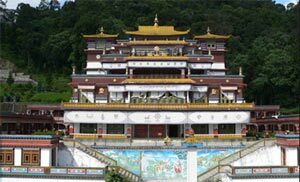 Sikkim with Gangtok as its capital city is another of those Hill Stations in India which are more in demand for the sake of their religious significance that is the Monastries, the giant Gompas and the Lamas, all belonging to the age of yore. A tour to Sikkim would easily reveal that its biodiversity is rich with lots of delights on offer for wildlife and nature aficionados, alike. Sikkim, a unique Hill Station among other Hill Stations in India is remote due to its far-flung location. It includes two Zoological gardens, to quote a natural scientist. They are the Orient and the Paeleoarctic. The number of Birds and butterflies is of the order of 500 and the orchids stand at a healthy number of 450. Endangered species of the order of Snow Leopard, Blue Sheep and Musk Deer comprise the predominant fauna of Sikkim. Its rich Wild Life reserves also make it a prominent Hill Station in India. A tour to Sikkim would also usher in the knowledge about the existence of the bearded Vulture and the mammoth Himalayan Griffon. Then, a tour to Sikkim would reveal the presence of the graceful Impeyan Pheasant with its ecstatic and loud, electric blue plumage and none of them is lovelier. Wild flowers such as the Wild Poppies are the ones, which are commonly grown in Sikkim as a prominent Hill Station in India. A tour to Sikkim would reveal that people in the cities like Gangtok have taken to planting and nurturing these wild beauties amidst their gardens in a well-systemized fashion and it has turned out to be fast developing hobby for some. 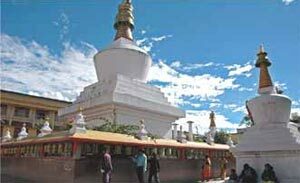 Apart from the thriving natural bounty of Sikkim, our major Hill Station in India, India Travel Destinations also organizes Tours to Buddhist seminaries and monasteries, which are symbolically innate to Sikkim, a prominent Hill Station in India. Adventure Silk Road Inc, provides an opportunity for fellow travelers to visit Sikkim and its attendant wilderness with its package tours and provides supplementary information on the propagated tour.